For the 20th-century British ambassador, see Joseph Addison (diplomat). For the British general, see Joseph Edward Addison. 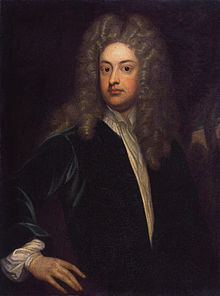 Joseph Addison (1 May 1672 – 17 June 1719) was an English essayist, poet, playwright, and politician. He was the eldest son of The Reverend Lancelot Addison. His name is usually remembered alongside that of his long-standing friend Richard Steele, with whom he founded The Spectator magazine. Addison was born in Millstone, Wiltshire, but soon after his birth his father, Lancelot Addison, was appointed Dean of Lichfield and the family moved into the cathedral close. He was educated at Charterhouse School, where he first met Richard Steele, and at The Queen's College, Oxford. He excelled in classics, being specially noted for his Latin verse, and became a fellow of Magdalen College. In 1693, he addressed a poem to John Dryden, and his first major work, a book of the lives of English poets, was published in 1694. His translation of Virgil's Georgics was published in the same year. Dryden, Lord Somers and Charles Montague, 1st Earl of Halifax, took an interest in Addison's work and obtained for him a pension of £300 a year to enable him to travel to Europe with a view to diplomatic employment, all the time writing and studying politics. While in Switzerland in 1702, he heard of the death of William III, an event which lost him his pension, as his influential contacts, Halifax and Somers, had lost their employment with the Crown. Addison returned to England at the end of 1703. For more than a year he remained unemployed, but the Battle of Blenheim in 1704 gave him a fresh opportunity to distinguish himself. The government, specifically Lord Treasurer Godolphin, commissioned Addison to write a commemorative poem about the battle, and he produced The Campaign, which was received with such satisfaction that he was appointed Commissioner of Appeals in Halifax's government. His next literary venture was an account of his travels in Italy, Remarks on several parts of Italy, &c., in the years 1701, 1702, 1703, published in 1705 by Jacob Tonson. In 1705, with the Whigs in power, Addison was made Under-Secretary of State and accompanied Lord Halifax on a diplomatic mission to Hanover, Germany. A biography of Addison states: "In the field of his foreign responsibilities Addison's views were those of a good Whig. He had always believed that England's power depended upon her wealth, her wealth upon her commerce, and her commerce upon the freedom of the seas and the checking of the power of France and Spain." In 1708 and 1709, Addison was a Member of Parliament for the borough of Lostwithiel. He was soon appointed secretary to the new Lord Lieutenant of Ireland, Lord Wharton. Under the direction of Wharton, he was an MP in the Irish House of Commons for Cavan Borough from 1709 until 1713. In 1710, he represented Malmesbury, in his home county of Wiltshire, holding the seat until his death in 1719. He met Jonathan Swift in Ireland and remained there for a year. Later, he helped form the Kitcat Club and renewed his friendship with Richard Steele. In 1709, Steele began to publish the Tatler, and Addison became a regular contributor. In 1711 they started The Spectator. The first issue appeared on 1 March 1711. This paper, which was originally a daily, was published until 20 December 1714, interrupted for a year by the publication of The Guardian in 1713. His last publication was The Freeholder, a political paper, in 1715–16. He wrote the libretto for Thomas Clayton's opera Rosamond, which had a disastrous premiere in London in 1707. In 1713 Addison's tragedy Cato was produced, and was received with acclamation by both Whigs and Tories. He followed this effort with a comedic play, The Drummer (1716). The actor John Kemble, in the role of Cato, revived at Covent Garden in 1816, drawn by George Cruikshank. In 1712, Addison wrote his most famous work, Cato, a Tragedy. Based on the last days of Marcus Porcius Cato Uticensis, it deals with conflicts such as individual liberty versus government tyranny, Republicanism versus Monarchism, logic versus emotion, and Cato's personal struggle to retain his beliefs in the face of death. It has a prologue written by Alexander Pope and an epilogue by Samuel Garth. The play was a success throughout the British Empire. It continued to grow in popularity, especially in the America, for several generations. It is cited by some historians as a literary inspiration for the American Revolution, being known to many of the Founding Fathers. General George Washington sponsored a performance of Cato for the Continental Army during the difficult winter of 1777-78 at Valley Forge. According to John J. Miller, "no single work of literature may have been more important than Cato" for the leaders of the American revolution. Nathan Hale's valediction: "I regret that I have but one life to give for my country." Washington's praise for Benedict Arnold in a letter: "It is not in the power of any man to command success; but you have done more—you have deserved it." In 1789, Edmund Burke quoted the play in a letter to Charles-Jean-François Depont entitled Reflections on the revolution in France, saying that the French people may yet be obliged to go through more changes and "to pass, as one of our poets says, 'through great varieties of untried being,'" before their state obtains its final form. The poet referred to is Addison and the passage quoted is from Cato (V.i. II): "Through what variety of untried being, through what new scenes and changes must we pass!" Though the play has fallen from popularity and is now rarely performed, it was popular and often cited in the eighteenth century, with Cato being an example of republican virtue and liberty. John Trenchard and Thomas Gordon were inspired by the play to write an epistolary exchange entitled, Cato's Letters, on individual rights, using the name "Cato." The action of the play involves the forces of Cato at Utica, awaiting the attack of Caesar immediately following his victory at Thapsus (46 BC). The noble sons of Cato, Portius and Marcus, are both in love with Lucia, the daughter of Lucius, an ally of Cato. Juba, prince of Numidia, one of Cato's warriors, loves Cato's daughter Marcia. Meanwhile, Sempronius, a senator, and Syphax, a general of the Numidians, are conspiring secretly against Cato, hoping to prevent the Numidian army from supporting him. In the final act, Cato commits suicide, leaving his followers to make their peace with the approaching army of Caesar—an easier task after Cato's death, since he was Caesar's most implacable enemy. Addison wrote the popular church hymn "The Spacious Firmament on High", publishing it in The Spectator in 1712. It is sung either to the tune known as "London (Addison's)" by John Sheeles, written c. 1720, or to "Creation" by Joseph Haydn, 1798. Joseph Addison in 1719, the year he died. The later part of Addison's life was not without its troubles. In 1716, he married Charlotte, Dowager Countess of Warwick, after working for a time as a tutor for her son. His political career continued, and he served as Secretary of State for the Southern Department from 1717 to 1718. His political newspaper, The Freeholder, was much criticized, and Alexander Pope, in An Epistle to Dr Arbuthnot, made him an object of derision, naming him "Atticus", and comparing him to an adder, "willing to wound, and yet afraid to strike." His wife was arrogant and imperious; his stepson, Edward Rich, was an unfriendly rake. Addison's shyness in public limited his effectiveness as a member of Parliament. He eventually fell out with Steele over the Peerage Bill of 1719. In 1718, Addison was forced to resign as Secretary of State because of his poor health, but he remained an MP until his death at Holland House, London, on 17 June 1719 (age 47). Addison was buried in Westminster Abbey. After his death, an apocryphal story circulated that Addison, on his deathbed, had sent for his wastrel stepson to witness how a Christian man meets death. On 6 April 1808, a town in upstate New York, (Middletown) was renamed Addison, in his honor. It is as an essayist that Addison is remembered today. Addison began writing essays quite casually. In April 1709, his childhood friend Richard Steele started The Tatler. Addison contributed 42 essays to the Tatler while Steele wrote 188. Regarding Addison's help, Steele remarked, "when I had once called him in, I could not subsist without dependence on him". On 2 January 1711, The Tatler was discontinued. On 1 March 1711, The Spectator was published, and it continued until 6 December 1712. The Spectator was issued daily and achieved great popularity. It exercised an influence over the reading public of the time. Addison soon became the leading partner in The Spectator. He contributed 274 essays out a total of 635; Steele wrote 236. Addison also assisted Steele with the Guardian, which began in 1713. The breezy, conversational style of the essays later prompted Bishop Richard Hurd to reprove Addison for what he called an "Addisonian Termination," or preposition stranding, a grammatical construction that ends a sentence with a preposition. He wrote an essay entitled Dialogues on Medals which was translated to the French by eighteenth-century priest and journalist Simon-Jérôme Bourlet de Vauxcelles (1733–1802). His essay "Adventures of a Shilling" (1710) is a brief, early example of an it-narrative or object narrative, a genre that would become more common later in the century. He also left an incomplete work, Of the Christian Religion. In 2005, an Austrian banker and collector named Albin Schram died, and in his laundry room a collection of a thousand letters was found, some of them of interest to historians. Two of them were written by Joseph Addison. The first reported on a debate in the House of Commons about a grant to John Churchill, 1st Duke of Marlborough, and his heirs, following the Battle of Ramillies. The letter was written on the day of the debate, probably to George Stepney. Addison explains that the motion was opposed by Misters Annesley, Ward, and Casar, and Sir William Vevian. "One said that this was showing no honour to His Grace but to a posterity that he was not concern'd in. Casar ... hoped ye Duke tho he had ben Victorious over the Enemy would not think of being so over a House of Commons: wch was said in pursuance to a Motion made by some of the Craftier sort that would not oppose the proposition directly but turn it off by a Side-Wind pretending that it being a money affaire it should be refer'd to a Committee of the whole House wch in all probability would have defeated the whole affaire...."
Following the Duke of Marlborough's successful campaign of 1706, the Duke and George Stepney became the first English regents of the Anglo-Dutch condominium for governing the southern Netherlands. It was Stepney who formally took possession of the principality of Mindelheim in the Duke's name on 26 May, after the Battle of Ramillies. Upon Marlborough's return to London in November, Parliament accepted the Duke's request that a grant of £5,000 'out of ye Post-Office' be made in perpetuity to his heirs. A second letter, written to Richard Steele was also found, concerning the Tatler and other matters. Addison's character has been described as kind and magnanimous, albeit somewhat cool and unimpassioned, with a tendency for convivial excess. His appealing manners and conversation contributed to his general popularity. He often put his friends under obligations for substantial favours, but he showed great forbearance toward his few enemies. His essays are noted for their clarity and elegant style, as well as their cheerful and respectful humour. William Thackeray portrayed Addison and Steele as characters in his novel The History of Henry Esmond. ^ "Addison, Joseph" . Dictionary of National Biography. London: Smith, Elder & Co. 1885–1900. ^ Deighton, Ken (ed.). Coverley Papers from The Spectator. New York, 1964: Macmillan. ^ Addison, Joseph (1767). Remarks on Several Parts of Italy, &c. in The Years 1701, 1702, 1703. London: J and R. Tonson. Retrieved 23 April 2013 – via Internet Archive. ^ Peter Smithers, The Life of Joseph Addison (Oxford: Clarendon Press, 1954), p. 382. ^ Joseph Addison, Cato: A Tragedy, and Selected Essays. ed. Christine Dunn Henderson & Mark E. Yellin. Indianapolis: Liberty Fund, 2004. ISBN 0-86597-443-8. ^ John J. Miller, "On Life, Liberty, and Other Quotable Matters," Wall Street Journal, 2 July 2011. ^ a b Richard, Carl J. (2009). Greeks & Romans Bearing Gifts: How the Ancients Inspired the Founding Fathers, p. 151. Rowman & Littlefield Publishers. ^ Burke, Edmund (1872) Reflections on the revolution in France, and on the proceedings of certain societies in London relative to that event, p. 232. Seeley, Jackson, and Halliday. ^ "The Spacious Firmament on High". Hymn Time. Retrieved 29 November 2015. ^ Memoirs of the Life and Writings of Sir Richard Steele, p. 148. Haskell House Publishers, first published 1865. ^ William Rose Benet, The Reader's Encyclopedia, s.v. "Addisonian Termination". ^ Bellamy, Liz (2007). "It-Narrators and Circulation: Defining a Subgenre". In Blackwell, Mark (ed.). The Secret Life of Things: Animals, Objects, and It-narratives in Eighteenth-century England. Cranbury, NJ: Rosemont. p. 119. "Archival material relating to Joseph Addison". UK National Archives.